Lloyd Bridges in the "Emergency Alert" episode. San Francisco International Airport is a television drama aired in the United States by NBC as a part of its 1970–71 wheel series . The series starred Lloyd Bridges as Jim Conrad, the manager of the gigantic San Francisco International Airport, which at the time the series aired was said to be handling over 15, 000, 000 passengers annually and employing over 35, 000 persons. Bob Hatten (Clu Gulager) was his chief of security, an important role at a time when security was beginning to emerge as a real-life major issue in air transport. June (Barbara Werle) was Conrad's secretary. Airport situations drawn from real life were addressed, such as protesting demonstrators, mechanical malfunctions, and similar problems. 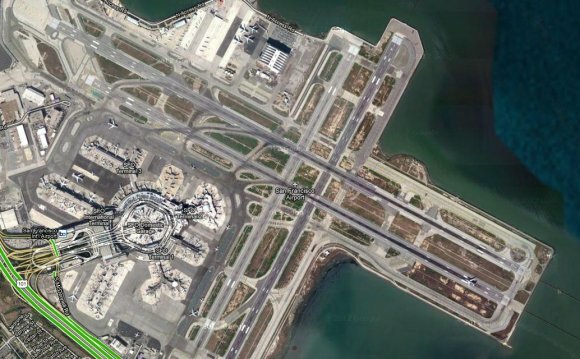 San Francisco International Airport was the second program in the Four in One rotation, following . The six episodes were first shown in order from late October until early December, 1970, and were then replaced in the Wednesday night 10 PM Eastern time slot by . Once Night Gallery and had completed their first runs, episodes of all four series were rerun interspersed with each other. Night Gallery was picked up for the next season as a stand-alone series and McCloud was renewed as an element in a new wheel series, , but San Francisco International Airport and The Psychiatrist were cancelled with no more episodes ordered beyond the initial six. The pilot for this series, also called San Francisco International Airport or simply San Francisco International, had been aired in the spring as a TV movie before the series premiered. It was largely similar, but starred Pernell Roberts as Conrad rather than Bridges. Despite the fact that critical response was underwhelming, the six episodes that comprised the series were ordered—with the stipulation that Roberts be replaced in the starring role by Bridges. This pilot was the subject of a sixth season episode of in 1994. "We Once Came Home to Parades"
"The High Cost of Nightmares"